This is the most common result of the pincer at . Black now has a choice of direction: he can reinforce the top-side group with a, or the left-side group with b or c.
If Black chooses , White will generally answer at , after which is common. 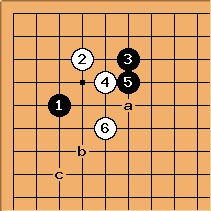 The joseki ends locally; White's next move is often to prevent the wall with from getting a good extension. There is another line to consider here, though. White can resist the peep by playing . is the usual response, though and a have also been tried. The order of and can be reversed, there are not enough pro games available to show a preference here. is an extension to b or c.